Created by the Museum of the City of New York and adapted to tour for NEH on the Road by Mid-America Arts Alliance. Visitors to the exhibition will experience a Riis presentation–immersive life-size photographs, as well as artifacts and personal documentation. 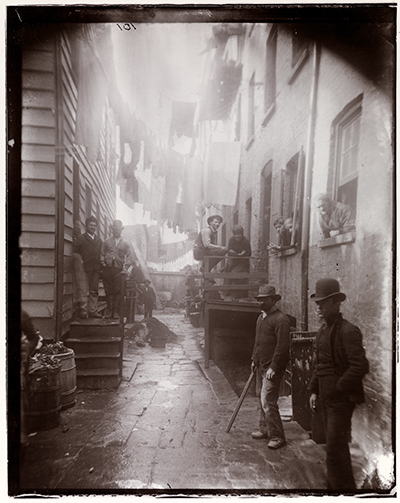 Jacob A. Riis, Bandits’ Roost, 1887-1888; reproduction on modern gelatin printing out paper, original 5 x 4 inches; From the Collection of the Museum of the City of New York, 90.13.4.104.
other squalid places in the city. His interests in writing about “how the other half lived” grew, and over his lifetime Riis wrote many books about the urban poor that included his photographs. Riis visited Wichita for well publicized lectures in 1903 and 1909. Visitors to the exhibition will experience a Riis presentation–immersive life-size photographs, as well as artifacts and personal documentation. The exhibition is made possible by the National Endowment for the Humanities. Jacob A. Riis: How the Other Half Lives is adapted from the exhibition Jacob A. Riis: Revealing New York’s Other Half, organized by the Museum of the City of New York. The exhibition was curated by Bonnie Yochelson and co-presented by the Library of Congress. It was made possible with major grants from the National Endowment for the Humanities and the Terra Foundation for American Arts, as well as support from D. Euan and Merete Baird, The Malkin Fund, Ronay and Richard L. Menschel, Queen Margrethe and Prince Henrick’s Foundation, C. Flemming and Judy Heilmann, Kan and Lotte Leschly, The Robert Mapplethorpe Foundation, and the John L. Loeb Jr. Foundation. This exhibit was adapted and toured for NEH on the Road by Mid-America Arts Alliance. The Museum is grateful to the Wichita Eagle, KSN-TV, Radio Kansas, Lawrence Photo Print & Frame, Dean Bradley & Patrick Habkirk, and Lee & Ron Starkel for their support of the exhibit and its programming.